In 2010, the U.S. Department of Justice revised the regulations governing the Americans with Disabilities Act Requirements for Service Animals. The information on this page may assist you to better understand the ADA's revised service animal rules. In 2014, the ADA National Network published a highly recommended self-advocacy resource titled Service Animals and Emotional Support Animals. Another great resource is the U.S. Department of Justice's Frequently Asked Questions about Service Animals and the ADA and The ADA Requirements for Service Animals. You may also contact Disability Rights Florida at 1-800-342-0823 if you have problems associated with your service animal. The Americans with Disabilities Act (ADA) 2010 Regulations define a service animal as “any dog that is individually trained to do work or perform tasks for the benefit of an individual with a disability, including a physical, sensory, psychiatric, intellectual, or other mental disability. Other species of animals, whether wild or domestic, trained or untrained, are not service animals for the purposes of this definition." C.F.R. § 35.104 and § 36.104 (2010). If they meet this definition, dogs are considered service animals under the ADA regardless of whether they have been licensed or certified by a state or local government. In addition to the provisions about service dogs, the ADA also has separate provision about miniature horses that have been individually trained to do work or perform tasks for people with disabilities. Miniature horses generally range in height from 24 inches to 34 inches measured to the shoulders and generally weigh between 70 and 100 pounds. Under the ADA, an individual with a disability is a person who has a physical or mental impairment that substantially limits one or more major life activities of such an individual; a record of such an impairment; or be regarded as having such an impairment. It’s important to note crime deterrence, safety or the provision of comfort or emotional support do not constitute "work or tasks" under the ADA. The Americans with Disabilities Act requires state and local governments, public accommodations, and commercial facilities to allow service animals to accompany individuals with disabilities in all areas where members of the public are allowed to go. 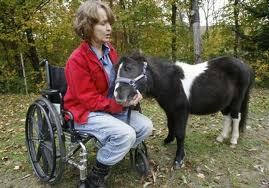 The entity may ask whether an animal is a service animal and what tasks the animal has been trained to perform. However, they may not require documentation that the service animal is trained or ask the person what their disability is. The Individuals with Disabilities Education Act (IDEA) and Section 504 of the Rehabilitation Act provide additional legal standards. While working, the service animal’s behavior must be under the control of its owner. A service animal should not pose a direct threat to the health or safety of others. If your animal is out of control and you do not take effective action to control your animal or your animal poses a direct threat to the health and safety of others, you may be asked to remove your animal from the premises. You are also responsible for the care or supervision of your service animal including care, food, and removing animal feces, as well as identification of appropriate locations for animal use. Title II of the Americans with Disabilities Act (ADA) and the regulations implementing it require state and local government entities, including public schools, colleges and universities, to make reasonable modifications to programs and services in order to allow access for individuals with disabilities. 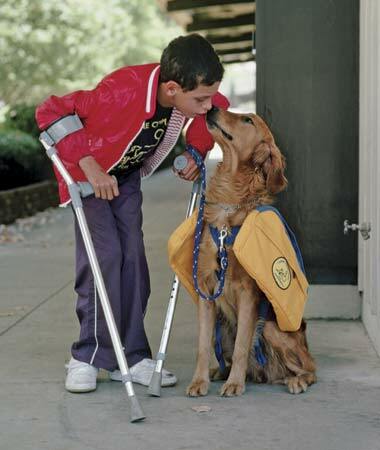 Service animals are recognized as reasonable modifications or accommodations under Title II. The Individuals with Disabilities Education Act (IDEA), and Section 504 of the Rehabilitation Act provide additional legal standards. For additional resources, including guidance from the Florida Department of Education regarding service dogs in Florida public schools, please visit the Links tab on this page. Title III of the Americans with Disabilities Act (ADA) and the regulations implementing it prohibit businesses that are open to the public from excluding a service animal from entering their establishments. Such businesses are called public accommodations. Examples of public accommodations include restaurants, theaters, hotels, grocery stores, hospitals and medical offices, department stores/malls, health clubs, parks, zoos, sporting facilities, and all public transportation systems such as airlines, car rentals, trains/metro systems, buses/shuttles, taxi services, etc. Note: Anywhere an individual with a disability as defined by the ADA is allowed to enter, a working service animal must also be allowed to enter. The Fair Housing Act also prohibits discrimination against an individual on the basis of disability when the individual is renting or buying property. For example, even if a building has a "no pets" policy, it would be a rights violation if the owner or manager refused to permit a blind applicant for rental housing who wants to live in a dwelling unit with a service animal. Please visit our Housing - Rights, Responsibilities & Resources topic webpage for detailed information and additional resources. Trains: Traveling with a service dog by rail (such as Amtrak) is covered under Title II of the Americans with Disabilities Act and therefore must satisfy the definition of service animal under the ADA. Emotional Support Animals would not meet the definition under ADA and therefore would not be eligible for travel as such. However, Emotional Support Animals may be able to travel under the organization’s established pet policy. Automobiles: Demand-response transportation examples include taxicabs, limos, and rideshare service programs such as Uber or Lyft. These transportation services are covered under the ADA and therefore must provide access and the service to individuals with service animals. For more information please review The Americans with Disabilities Act and You: Frequently Asked Questions on Taxicab Service. reckless disregard, interference with, or allowing a dog to interfere with, the use of a service animal by obstructing, intimidating, or otherwise jeopardizing the safety of the service animal. reckless disregard resulting in injuries or death of a service animal. intentionally injuring, killing or allowing a dog to injure or kill a service animal. Restitution, including the value of the service animal; replacement and training or retraining expenses for the service animal and the user; veterinary and other medical and boarding expenses for the service animal; medical expenses for the user; and lost wages or income incurred by the user during any period that the user is without the services of the service animal, may be required. Access a summary publication called Revised ADA Requirements for Service Animals from the U.S. Department of Justice's ADA.gov website. Access the complete 2010 Title II regulations governing Nondiscrimination on the Basis of Disability in State and Local Government Services from the ADA.gov website. Access the complete 2010 Title III regulations governing Nondiscrimination on the Basis of Disability by Public Accommodations and in Commercial Facilities from the ADA.gov website. Frequently Asked Questions about Service Animals and the ADA. If you are denied access or encounter an issue with your service animal under Florida law, please contact us at 1-800-342-0823. Florida Statute Chapter 413.08 - Rights of an individual with a disability; use of a service animal; discrimination in public employment or housing accommodations; penalties from the Online Sunshine website. Florida Statute Chapter 413.081 - Interference with or injury to a service animal; penalties; restitution laws from the Online Sunshine website. Access the Florida Department of Education's 2010 Memo and Guidance on the Use of Service Animals by Students with Disabilities from the Exceptional Education and Student Services Publications webpage. Pet Partners website (formerly known as the Delta Society).